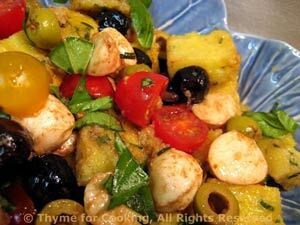 Polenta Salad, with Tomatoes, Olives and Mozzarella, Thyme for Cooking sides. The cooking time assumes quick-cooking polenta. This idea came from the recipe for Italian Bread Salad. We so rarely have the type of bread needed for the salad (leftover) I decided to come up with my own version using polenta cubes. I used a combination of Greek and green olives, but any will work. Use your favorites. 8 - 10 small mozzarella balls, half of a package they're about the size of the tomatoes Keep any left in the liquid. You could use half of a larger, whole mozzarella, roughly chopped. Bring stock to boil in a small saucepan. When done remove from heat and pour into a small pan or baking dish lined with lightly oiled plastic wrap (cling film, saran wrap...). You want the polenta to have a flat surface 1/2 - 3/4 inch (1.5 - 2cm) thick. I use a small, flat skillet with straight (vertical) sides. Smooth the top as flat as you can, cover with plastic wrap and refrigerate. Can be made hours ahead, in the morning or the evening before. Cut cherry tomatoes, olives and mozzarella balls in half and put into a salad bowl. Snip chives and cut large basil leaves in half; leave small ones whole. Add herbs to bowl. Whisk together 1 tbs vinegar and 2 tbs oil. Add to bowl and stir to combine. Cut polenta into 1" (2.5cm) squares or chunks. Heat 1 tsp oil in a nonstick skillet. Add polenta and fry until golden. Add polenta to bowl, mix gently and serve. Note: Polenta can vary between brands and types. When making polenta for cooling and cooking again, either frying or on the grill, it's important to get it very stiff. It should be hard to stir, and hold any shape you put it in when you are done cooking it - before chilling it. If it isn't stiff enough, sprinkle another 1 - 2 tsp polenta per 1/4 cup on the cooked polenta and stir in, vigorously. When cool it should be very firm. Note 2: Polenta can be cooled quickly by setting the metal or heat-proof pan in a bit of cold water to start, then putting it in the fridge or freezer. If cooling quickly, don't cover.